Anushree Reddy has been a favourite for brides since years now. Her candy coloured lehengas are a crowd favourite. From beautiful baby pinks to bright yellows and some traditional reds, her collection always has something to please everybody. This time around, Anushree Reddy 2018 Bridal Wear Collection consisted of a whole lot of pinks from millennial pink, baby pinks, to romantic pink with tulle skirts. If anyone has seen some of her summer edit limited edition, you know what I am talking about. To be honest, some of these colour shades are pretty new to me as well. Romantic pinks, millennial pinks, I know I would totally fail a colour test. But this is no exam, thankfully. Anushree Reddy 2018 Bridal Wear Collection is like an extension of her signature style. Dainty lehengas which are quintessential prettiness. 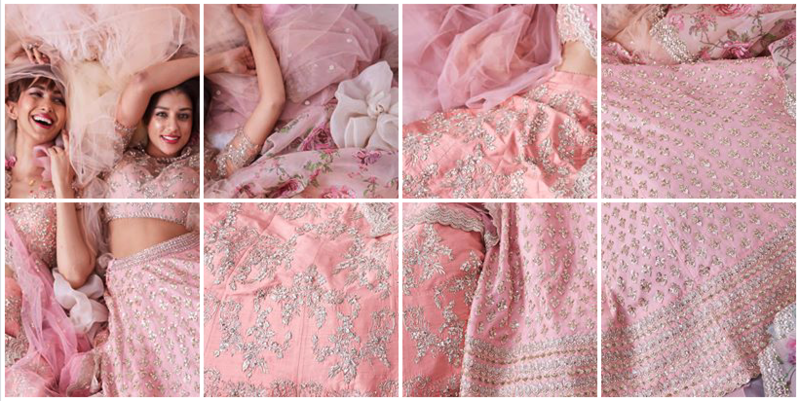 There is just no reason to not love Anushree Reddy. She knows exactly what she does well, and continues to do better of it. If you notice, the colour shades are slightly different than each other. If you are a pink person, Anushree Reddy 2018 Bridal Wear Collection will give you a range of lehenga colours to choose from. My favourite from her summer bridal collection are the millennial pinks. Featuring a rich millennial pink shade, this lehenga dazzles with beautiful gota patti embroidery and zardozi work. It comes with a peach v-neck blouse in zardozi and sequin work, worn by Ileana D’Cruz. For the complete celebrity vibe, pair with long crystal danglers and silver peep-toe heels. This is the second colour option you can go for if you’re not too much into pink lehengas. Gold looks traditional yet classy and teamed up with Gota-Patti, it makes it even more royal. The beautiful hand embroidered dupatta and the heavy blouse make it every bit a stunner wedding lehenga. The embroidery on this gorgeous pink lehenga makes it my top favourite from the Anushree Reddy 2018 Bridal Wear Collection. Sure, it is slightly on the pricier side, but look at the richness on the lehenga skirt. That Gota Patti hand embroidered outfit is every bit worth the price. Tulle skirts are trending in 2018. If you want to see more options in the tulle lehenga skirts, check out Mrunalini Rao’s collection. You will easily find tulle lehengas in the INR 70k to INR 1.5Lakhs. This one is a nice outfit to wear either for your reception night party or even for your sangeet event. The ruffles sleeves without the dupatta make it uber comfy chic to party the night away. A lot of brides these days are also opting for ivory lehengas, or similar shades in silver, greys, and off-whites. These colours are the new nudes of 2018 bridal fashion. They look great from morning to evening, whether you wear for your nuptials or for the after party. This ivory and grey lehenga is riddled with extravagant silver sequin and zardozi embroidery. It comes along with a similar embroidered short sleeve blouse, enhanced by a deep open back design. Scallop borders is another trendsetter for 2018. Almost every premium designer is going with scallops in lehenga borders or dupatta. This one is a beautiful piece to wear especially if you’re not too keen to show off your midriff section. It covers really nice and the delicate hand embroidery makes it seamlessly blend with the lehenga skirt. Accentuated with gold zardozi embroidery and shimmering sequins, this cream lehenga is an absolute show stopper. The delicate embroidery with pearls and fine silver beads creates a dazzling effect. The lehenga comes along with a geometric embroidered blouse and dupatta for the complete look. Anushree Reddy 2018 Bridal Wear Collection also has some beautiful delicate floral lehengas in yellows and greens. You can choose to wear these for your mehendi or other pre-wedding functions. Yellow vs. Pink? Which one do you prefer more? I wouldn’t call this lehenga a wedding lehenga as such, but this royal blue lehenga would make for an amazing sangeet night outfit. The rich colour is guaranteed to look great in photos, and with its heavy embroidered blouse, you know nothing will go wrong with this look. You Can Now Shop Pakistani Bridal Lehengas From Indian Designers!